A 2018 joint study by Retail Info Systems and Gartner found that retail leaders (those with a 2017 revenue increase of 5% or greater) were nearly twice as likely to identify analytics as a key strategy over the next 18 months compared to retail laggards. With the continuing demise of household names in the retail industry, it’s clear retailers that avoid making a digital transformation will suffer at the hands of more nimble competitors. To help retailers come to grips with the data revolution, we hosted a webinar (Real Talk in Retail: E-Commerce, Consumer Goods or Retail? ….or All of the Above?) with solution partner, Cervello. During the discussion, Cervello managing director, Chris Boulanger, touched on the technology trends and transformations bringing unprecedented change to the retail landscape, including: digitization of the path to purchase, disruption to traditional retail and consumer packaged goods channels, and the purchasing habits of Millennials. According Boulanger, traditional data management methods cause problems because they’re slow, inflexible, require significant change management, and remain costly to maintain and operate. Data needs to be combined as quickly as possible from any source with internal data and hierarchies, then made available in near-raw format for use by data scientists, and in analytic form for enterprise users in sales, marketing, finance, supply chain, and executive management. To innovate, retailers must provide meaningful and easy access to critical data, yet many Brick and mortar retailers are struggling to adapt and are now feeling the pressure as online retailers have grown in dominance. While Top retailers such as Toys R Us, Claire’s, Radio Shack and others have failed under the new retail reality, the survivors and new entries to the market thrive because they’ve embraced technology-driven business models that position them to maximize the value of data to quickly understand what’s working well and what’s not. In the retail world, where margins are thin, the ability to scale quickly to support virtually unlimited users and workloads is a huge bonus. Snowflake frees overworked IT staff for other duties by offloading data warehouse management and eliminating the need for expensive hardware and software. 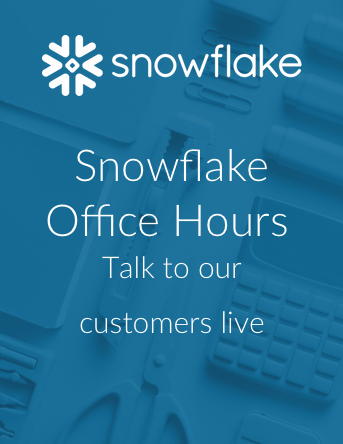 As the number of customer touch points and corresponding volume of data increases, the scalable power provided by Snowflake’s cloud-based data warehouse is vital. To learn more about the ways retailers mine new insight out of point-of-sale, clickstream, inventory, and other data streams, watch the webinar here or visit Snowflake for Retail.